From a distance, the church looks like it has been built on top of a low hill. It glows bright yellow against the burning blue sky, a beckoning beacon above the city. The church is called Nuestra Señora de los Remedios, which means Our Lady of the Remedies. It is a Roman Catholic church built in the 16th century by the Spaniards and is considered to be one of the most important churches in Mexico, for it houses the 27cm tall, gilded statue of the Lady of the Remedies, the oldest venerated image in Mexico. It was brought to the country in 1519 by a Spanish conquistador, although the statue itself is much older. 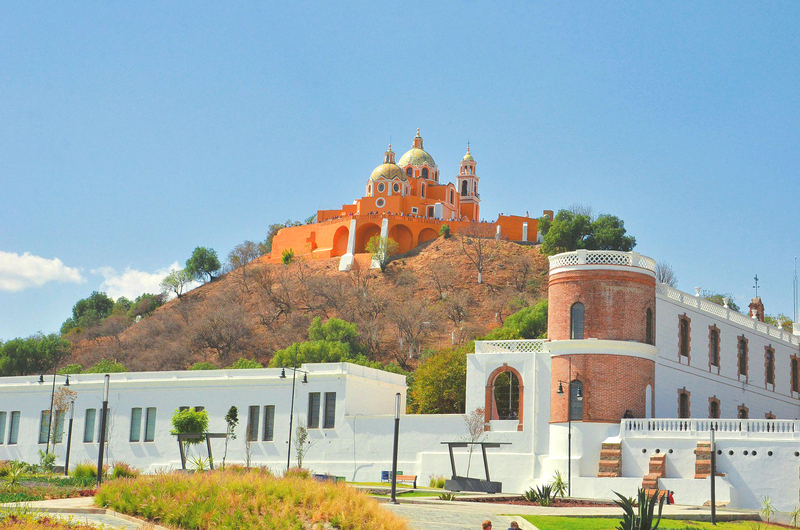 Cholula city is not without its charms, but it is undoubtedly best known for the church on the hill. The city itself is located a short distance from another larger city called Puebla, a couple of hours’ drive from Mexico City, over a high pass some 3,000m above sea level. Cholula was the second largest city in Mexico in pre-Columbian days, before the Spaniards arrived in the early 16th century. On the average weekend, Cholula looks like a festival town with thousands of visitors, many of them locals, descending on it. Most come to climb the hill to the church, and there is plenty to see in the town itself. The church seems more like a tourist attraction than a place of worship. In the church compound, against the scenic backdrop of the surrounding country, with Cholula spread out like a map below, visitors crowd the railings to take selfies of themselves. There is a carnival atmosphere. Vendors in the shade of a big tree in the church compound offer huge tostadas to hungry patrons who have trudged up the hill. There is a dense crowd in the church, both curious tourists and deeply religious locals who pause before the altar or bring offerings, sitting in the pews in silence amid the hubbub around them. To get to the church, it is a long, gradual climb up the hill on a paved walkway and shallow staircase. Immediately before the top, there is a short but steep set of stairs leading to the church compound, so steep that most people have to hold onto the handrails as they ascend or descend. You would think the builders could have been more considerate and constructed a gentler slope for this last section. But this is no ordinary hill, and its profile is not natural. Beneath the vegetation-covered hill and its massive slopes is a man-made structure, an ancient pyramid, which by volume is the largest such structure in the world. It is generally called the Great Pyramid although it has many names. Scattered around nearby, if you look carefully, there are the remains of other smaller buildings and structures. This was once a complex of buildings, now reclaimed by time, neglect and nature. The Great Pyramid was already ancient when the Spaniards stumbled across it in the 16th century. It had been used for centuries before by the Indian civilisations that inhabited this part of the world, each civilisation building successively upon earlier pyramids until it assumed its massive size. The pyramid has been dated to the third century BC. Pyramids are common to ancient cultures all over the world, but the Great Pyramid of Cholula bested them all, for the base measures 450m by 450m, with a height of over 60m. In terms of sheer size, it is one-and-a-half to double that of the Great Pyramid of Giza in Egypt. It is not known which of the pre-Columbian Indian cultures built the pyramid, but it was used for religious ceremonies, and would have had a temple at the very top, with a grand staircase or staircases sweeping up to the summit temple. From archaeological evidence, it is known that the pyramid was used for human sacrifice, including child sacrifice. The Spaniards abhorred the practice, but were not above some bloodletting themselves, slaughtering thousands of citizens in Cholula, with estimates ranging from the low thousands to tens of thousands. The pyramid is a relic of the great Mesoamerican Indian cultures, which developed to an astonishing degree. They had an advanced understanding of sciences such as mathematics, engineering and astronomy, besides developing intricate art forms, distinct cultures and belief systems, and building monumental structures that continue to awe to the present day. Excavations of the pyramid were undertaken in the 20th century, with over 8km of tunnels unearthed, some sections of which are open to visitors. And so, thousands of people undertake the pilgrimage to the church on the pyramid on a typical weekend, but do they come for the church or is there the underlying draw of the pyramid — the glory of native cultures and civilisations that were once great and flourished before they all came to a tumbling end? The conquest of the great Aztec empire in the 16th century by a small number of Spanish conquistadors under the leadership of Hernán Cortés makes for some compelling reading. Upon the conquest of the Aztec capital, the Spaniards systematically destroyed the empire, killing off its noblemen, razing the temples and pyramids, plundering its wealth and melting down its precious gold artefacts. The native population was demoralised, decimated by famine and a disease to which they had no natural resistance — smallpox, newly introduced by the foreigners. They were converted wholesale to the new religion. Mexico became New Spain, and Spain ruled the country for the next 300 years. Some two centuries after the end of Spanish rule, the majority of the population is Roman Catholic, the official language is Spanish and many of the country’s institutions carry the imprint of its colonial overlord. In Cholula and Puebla, more than in most cities, Spanish heritage is particularly strong. 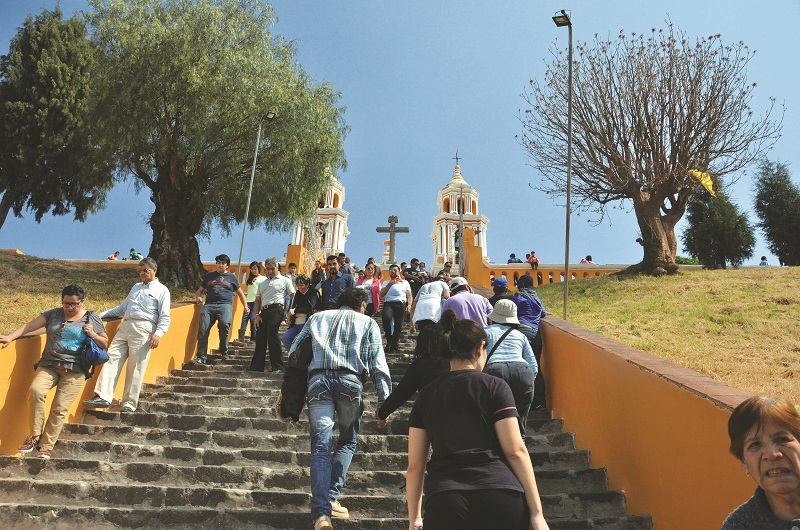 Cholula has over 170 churches and, apparently, more religious processions than any other city in the country. 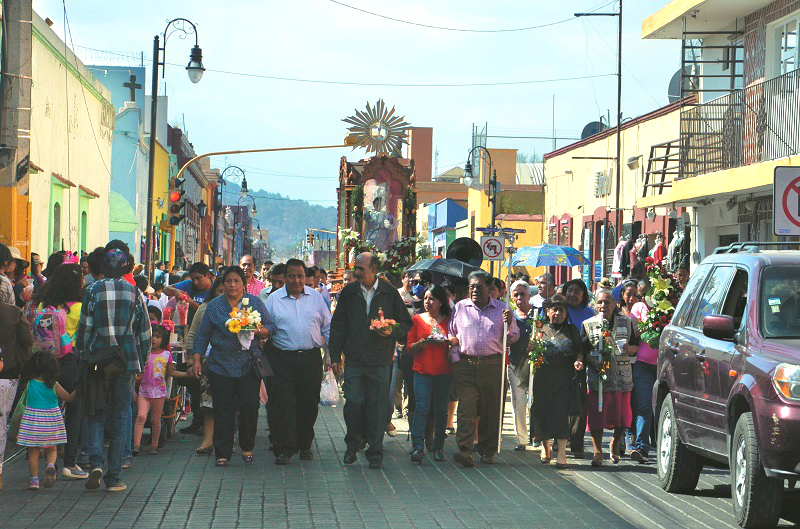 At any one time, the visitor is likely to stumble across an exuberant procession with plenty of colour and loud firecrackers — a Cholula tradition. On the streets, the local character asserts itself, with vendors selling fried grasshoppers of various flavours — plain, garlic or chilli, señor? — and various herbs and colourful pastries that owe little to Hispanic influence but much to the Mexican penchant for colour and sweets. Puebla is well known for being one of the most “Spanish” cities in Mexico and is a Unesco World Heritage site, quoted for its 16th-century architecture and characteristic town layout. 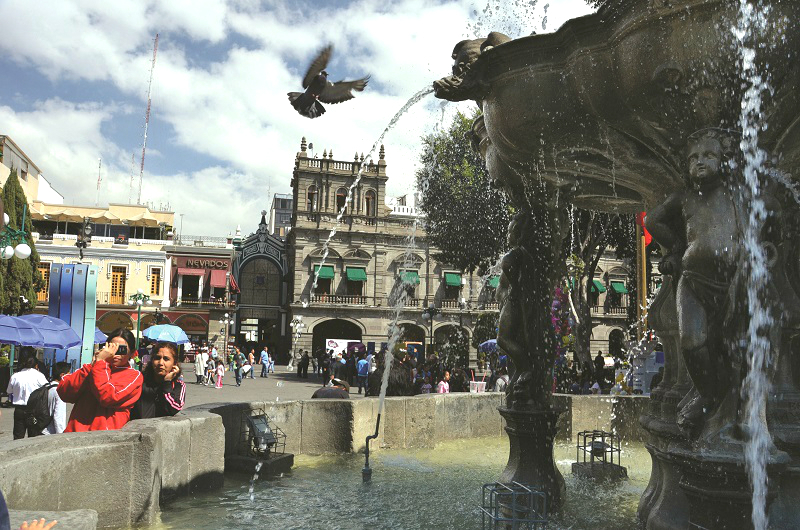 The town square is delightful, fringed by large, shady trees, with fountains, shrubbery and grassy areas, while street vendors ply a healthy trade to tourists, both local and foreign. The great 16th-century cathedral on one side of the square is quite magnificent, with the tallest church spires in Mexico. There are many angel motifs to be seen, such as on the metal fence and the statue in the town square, for it is said that the site of the town was revealed to a Franciscan brother by an angel in a dream. 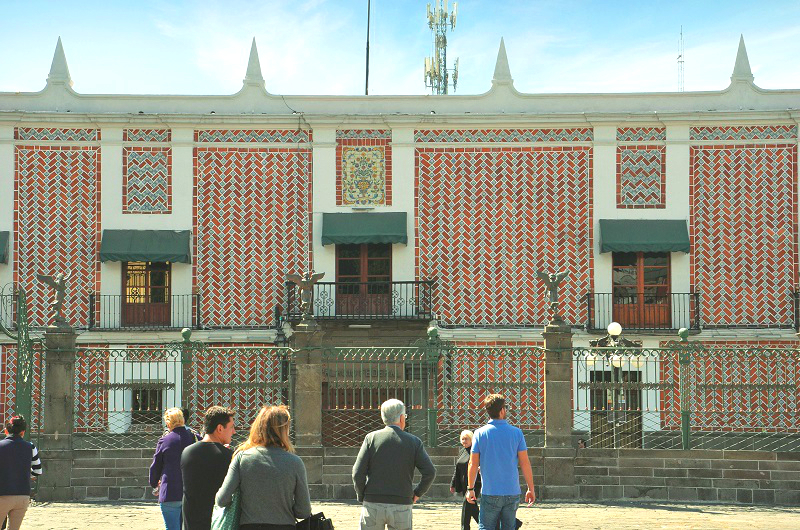 Many of the buildings are of the grand baroque architecture more commonly encountered in the Old World and many are covered in the characteristic azulejos, for which Puebla is particularly well known. Even now, visitors come to the town to buy the tiles, which are cheaper and of a better variety than those elsewhere. Even in this bastion of Spanish-ness, the local character asserts itself. Although Spanish churros have become a favourite dessert, Puebla is well known for its culinary contribution to Mexico, claiming to be the birthplace of mole poblano. Mole is a family of sauces, which sometimes includes chocolate. So, while in Puebla, it is the thing to have a meal, which includes mole chicken — chicken pieces in a thick, dark sauce of peppers, other ingredients and a little chocolate. As you would expect, families and restaurants have their proprietary recipes for mole. 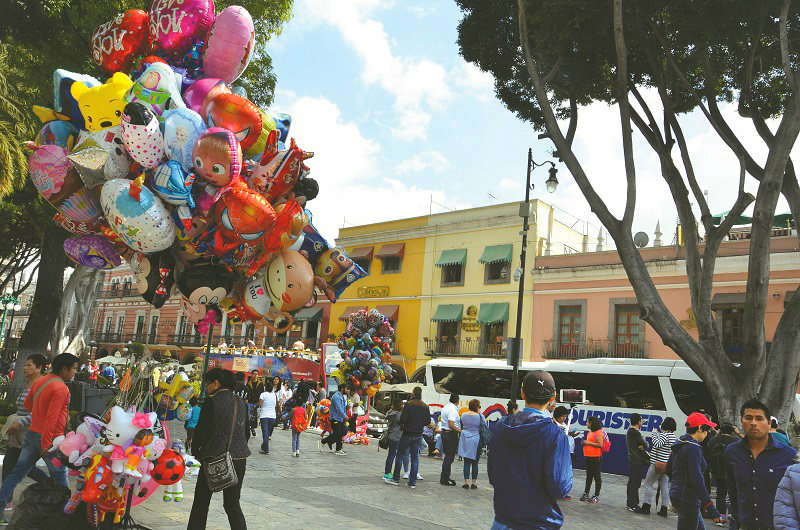 Nowadays, Puebla has evolved to become an industrial town, for, although best known for its colonial heritage, it is home to the largest Volkswagen plant outside Germany, employing 20,000 people to build the cars for export to the US — a trade practice that President Donald Trump rails against. Spanish in appearance and architecture, underlain by a strong Mexican identity, the imprint of exuberant, local character and colour is evident in both the cities. The church on the pyramid is a metaphor for that coexistence, the new built on the foundation of the old, creating a unique amalgam of the two. This article first appeared on Dec 24, 2018 in The Edge Malaysia.